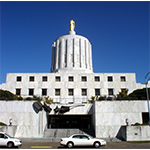 SALEM, Oregon — Oregon voters would get to decide whether money from the taxpayer kicker fund would go towards schools under a resolution being considered in the legislature. The measure that would go to voters would create a personal investment in education fund where all kicker money would go. Bennett Benton with Tax Fairness Oregon thinks the kicker doesn’t make sense. “An irrational, counterproductive constitutional provision,” Benton said. Tootie Smith with the Taxpayers Association of Oregon said in 2000 Oregonians voted to protect the kicker. “What we consider an attempt by lawmakers to steal the kicker from ordinary taxpaying Oregonians,” Smith said. If approved by voters, the measure would require a three-fifths majority vote in the Legislature to use the funds. Their priority would be on seismic retrofitting of schools and behavioral health counseling.